The following are our highly recommended links for the serious maritime history enthusiasts and these include our maritime friends, artists, associations, and companies. They represent the finest in maritime art, tourism, professional services or historical societies that we are proud to have known and have been associated with over the years. Please feel free to click on these links to explore and patronize these maritime associates. If they are on our links page, they are among the very best at what they do! If you are of a certain age, you remember the yearly trip to Bob-Lo Island Amusement Park or the annual Moonlight Cruise you would take on the famed steam-powered, near-sistership passenger boats, the "Columbia" and the "Ste. Claire". Sadly, while both still exist, and ostensibly are in the process of restoration, the boats have not run since laid up for the final time in September of 1991. The "Bob-lo Boats" were as much a part of Downriver life and culture, as the river itself. Fortunately, Captain William A. Hoey was a visionary entrepreneur who saw their pending loss as leaving a huge maritime entertainment gap that needed to be filled. 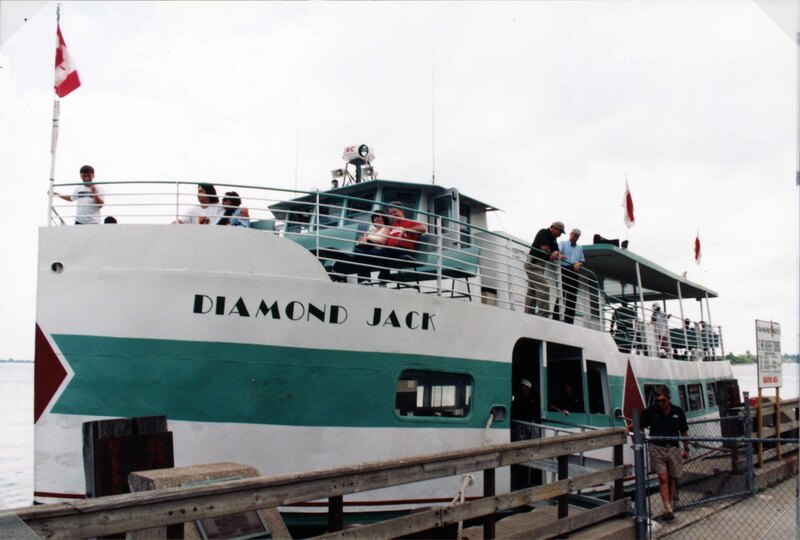 He purchased a former Mackinac Island ferry the same year the Bob-lo boats were laid-up, renamed her the "Diamond Jack" and started the Diamond Jack's River Tours and began giving sightseeing tours out of a downtown Detroit dock. The company thrived and would eventually add the larger "Diamond Belle" and flagship "Diamond Queen" by 1993. 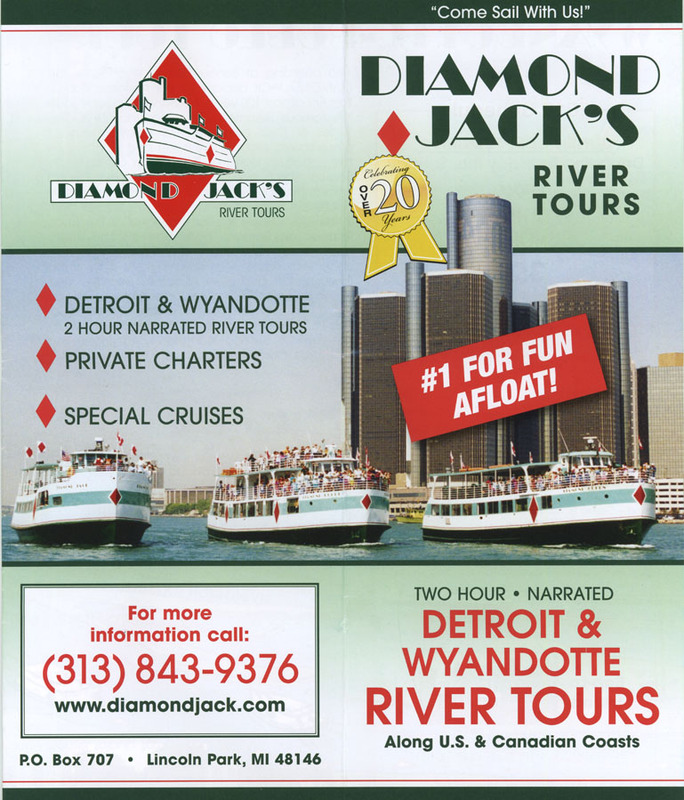 The Detroit (or "Upper River") tours were so popular that Bill asked local maritime historian, Keith M. Steffke, to write the initial narration for the proposed Wyandotte run (or "Lower River") tours that would begin in the Spring of 2000. Steffke worked on the vessels for a few seasons and could be found every Saturday and Sunday on the boats narrating the fascinating maritime history of the region. A tour trip on one of their ships is a "lifetime memory" for friends & family visiting from out of town, or a way to re-live the thrill of what riding the Bob-lo boats was like, on one of their moonlight cruises. These mini-ships are an excellent, unique choice of venue to hold a High School Reunion, Wedding, Graduation or Anniversary Party or as a fund-raiser for your favorite charity. Steffke, with his unmatched historical knowledge of the area, is still occasionally invited back to narrate special trips. The company runs special sight-seeing trips, such as their annual Fall Color & Lighthouse tours for certain historical groups wanting to see the "maritime minutiae" of the area. Local landmarks, like the old slip of the Great Lakes Engineering Works, where the ill-fated "Edmund Fitzgerald" was launched, or the last remaining historic Lighthouse left on the Detroit River (one of the 1906-built former Grosse Ile range lights), are just a few highlights of such seasonal tours. With Cap's retirement, the firm is now operated by Bill's daughter and her husband; call them now so that you can learn about their regularly scheduled sight-seeing tours, special cruises, or set aside a date on which to plan your family reunion or other special occasion and re-live a piece of our own unique, Downriver maritime heritage. When steam boating was just coming of age, almost any sailor on the lakes would self-produce an image of their ship, however crudely, on a piece of paper. He'd proudly show off "his boat" down at the hometown barbershop (or local saloon) to his friends, while home during winter lay-up. In the decade of the 1840's real "Sailor Artists" began to appear on the Great Lakes and by the Civil War they were quite common. They usually worked with thick, rough paper (like that used in meat wrapping) and drew in pastels, charcoal, chalk and some painted with the more expensive oils. While these early Lakes' artists were never professionally trained, they did usually produce technically correct views of ships before the age of photography began to capture images of them. Men like Vincent D. Nickerson (1844-1910) and Charles W. Norton (1848-1901) are the best known of these early regional artists. While the volume of work they produced was huge (every one of their shipmates wanted one, and the owners, too! ), only a fraction survived due to the materials they were made of, along with the era and clientele they were given too. At a sailors wages, it was cheaper just to tack the picture on the wall, instead of providing a costly frame for it. 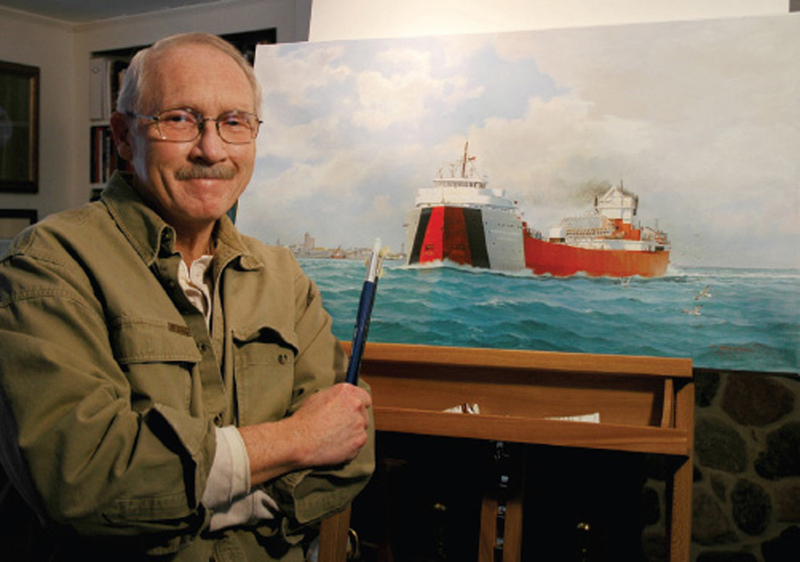 Paul C. LaMarre, Jr. is one of the few living marine artists that is truly a "Sailor Artist", in the old tradition. A licensed Captain, with multiple endorsements, LaMarre's work is unique in that virtually every piece he produces is an "action" shot, produced in equally bold colors. A mutual friend of ours, former Dunbar & Sullivan Dredging Co., and later Gaelic Tugboat Co., fleet Captain Roger Stahl (1923-2010), once said of LaMarre's work: "If Paul drew it that way, that is how it was!" Unlike the earlier men, however, LaMarre did informally learn the ways of a marine artist, not by taking art school courses, but under the tutelage of his mentor, the famed "Maritime Priest" and historian Father Edward J. Dowling, S.J. (1906-1996). 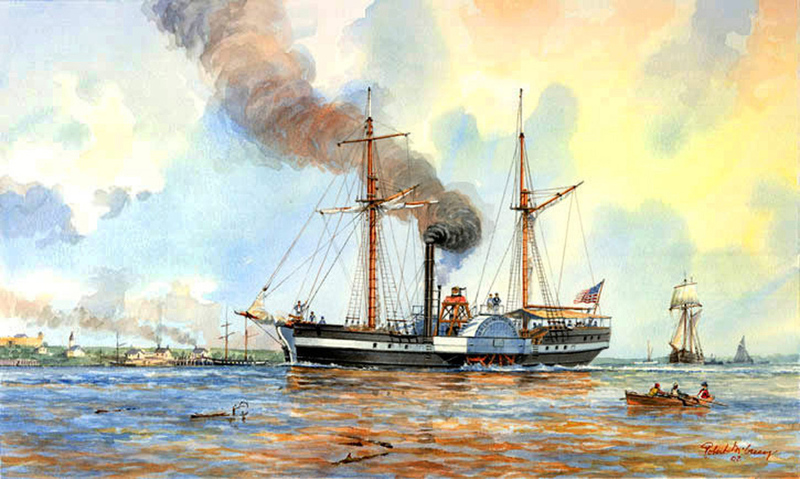 Father Dowling's works in watercolors are priceless for their accuracy, historical value and visual appeal; he was also one of the few "modern" marine artists that was old enough to know many of the older historic boats, firsthand. Paul C. LaMarre, Jr. has certainly honored his teacher by being the most faithful artist in carrying on that "Sailor Artist" tradition. He is also, undoubtedly, the only student of Fr. Dowling's that went on to become an internationally recognized artist, in his own right. LaMarre has works in every major (and many minor!) corporate shipping offices, marine museums and advanced personal collections around the country. While LaMarre pursued his collegiate work in business, he steadily worked with Fr. 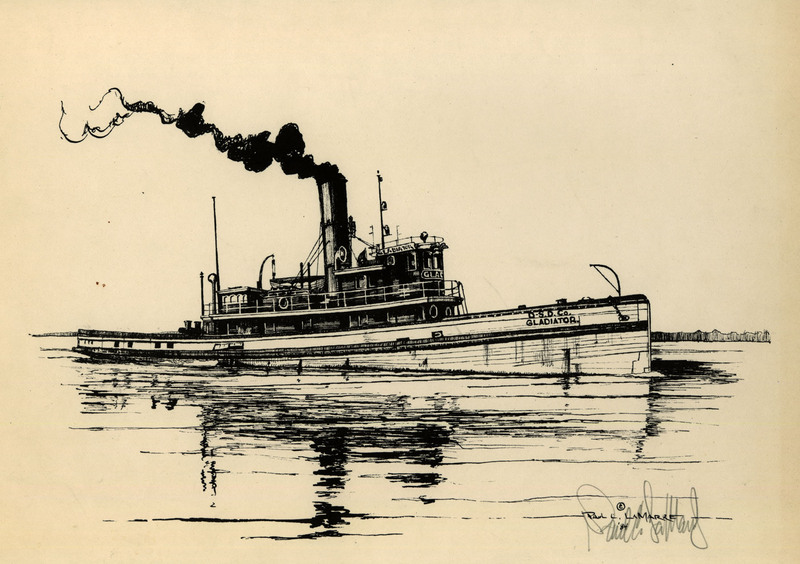 Dowling developing his skills, and worked the Detroit area dock and shipyards to gain a working knowledge of his subject. He is one of those very few, fortunate individuals that has a job that carry's over to his first love - he is an officer of the Gaelic Tugboat Co and the Diamond Jack River Tours. He also has the rare distinction of being the last marine historian to have seen and photographed the ill-fated "Edmund Fitzgerald", just days before she was lost with all hands. We are proud that LaMarre has a number of our models and that he is so willing to share his specific knowledge of marine architecture and design when we are "stumped" about how something should look. Please take a look at Paul's Gallery and consider a commissioned work by him of your favorite boat. If you do, you will also know for certain that, "If Paul drew it that way, that is how it was!" to quote Captain Stahl. We are pleased to say that Robert McGreevy is not just our friend, but has commissioned us to make models and restore rare pieces for him, as well. Marine art on the Great Lakes was virtually dead from the 1930s until the 1970s, at least as far as "serious" art critic's were concerned. McGreevy is almost single handedly responsible for resurrecting Great Lakes "Ship Portrait" painting, as an appreciated genre. Professionally, McGreevy studied at the renowned Center for Creative Studies (then known as the Society of Arts & Crafts), and then worked as a designer for the Chrysler Corporation as a vocation and is now retired. His avocation, however, since at least the 1960s has been to research and depict the obscure, transitional, pioneering and other important vessels of interest on the Great Lakes through pen & ink drawings, oils, acrylics and watercolor paintings. 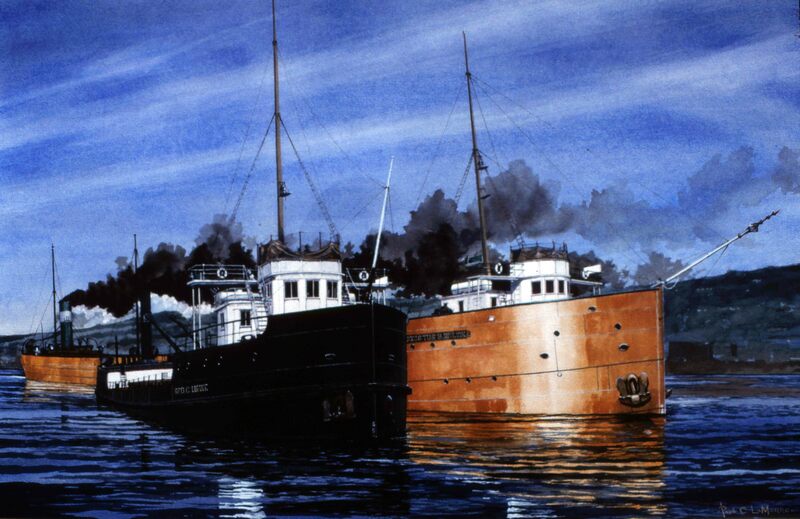 The artwork of Robert McGreevy continues in the tradition of a long line of previous Great Lakes marine artists. He could be considered the direct artistic descendant of Robert Hopkin (1832-1909), Seth A. Whipple (1855-1901), and Howard F. Sprague (1871-1899). While the ships he depicts are beautifully & accurately drawn (and meticulously researched), he pays an equal amount of attention to their natural surroundings and backgrounds. Elements in his works, such as the proper period port landscapes and the navigational seascape settings are as outstanding as the vessels they encompass. In this one respect he surpasses even the three previously noted marine masters - none of which ever worked as sailors, and rarely saw the actual ships that they painted (they relied heavily on drawings and blueprints). Steffke was pleased when asked by McGreevy to join him in a "two man" show that ran at Port Huron's Studio 1219 in the Summer of 2008. Steffke's models were used to complement and highlight Robert's dramatic artworks. The pair also gave alternate maritime programs to the visiting public. They each continue to speak before historical groups yet today, on varied maritime topics. McGreevy recently published his own scholarly maritime history, "Lost Legends of the Lakes" which is available directly from his website. If commissioning a ship model from us is important to you, as a serious collector and marine historian, then we suggest you also contact Robert to commission a "one of a kind" piece of artwork, as well. Who knows? He may use one of our models to guide him in your commission! Remember if you can't afford an original work, he offers many of his signed and limited edition prints at a very reasonable price. These are sure to only appreciate in value in the years to come. On the Great Lakes, there is a tradition going back to at least the 1860's, of taking a lowly blueprint and framing it as a work of art. 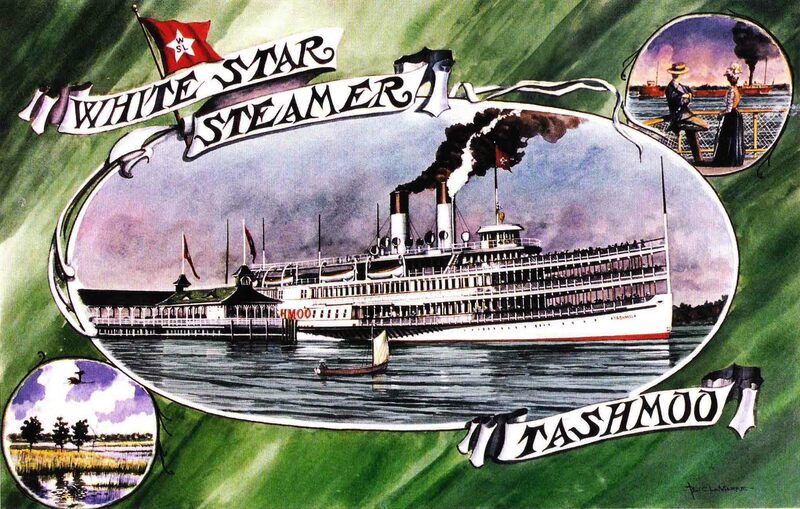 When the prints were actually still blue in color and printed on heavy paper, one could find them in nearly every tug yard, passenger ship and terminal office on the lakes. As new ships were built and commissioned, the old blueprint would be removed and the "latest design" inserted in its place. Many examples of these historic prints are housed in our own archival collection. 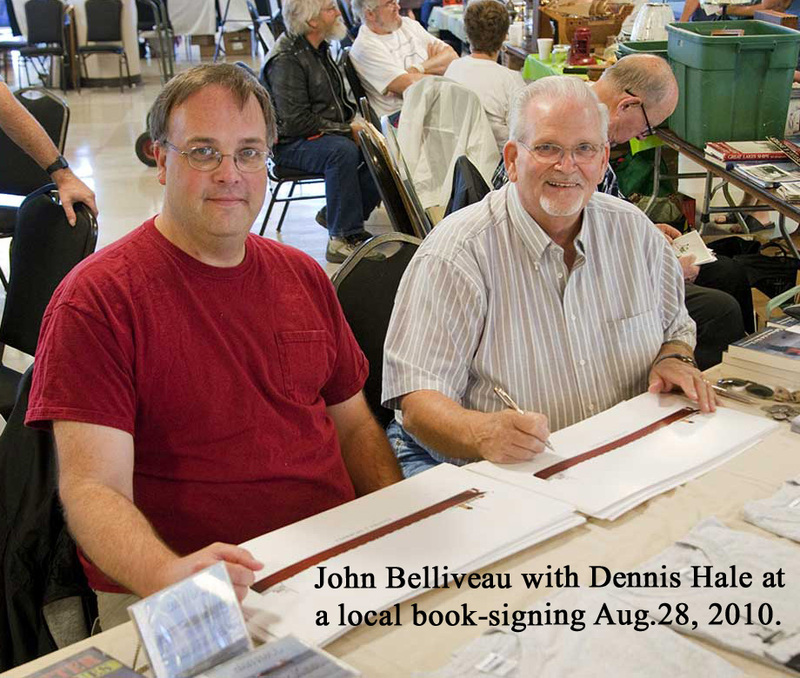 Our friend, Mr. John Belliveau, is definitely an artist that takes his inspiration from the highly talented draftsman from the last century that produced those meticulous drawings from which the great ships were constructed. 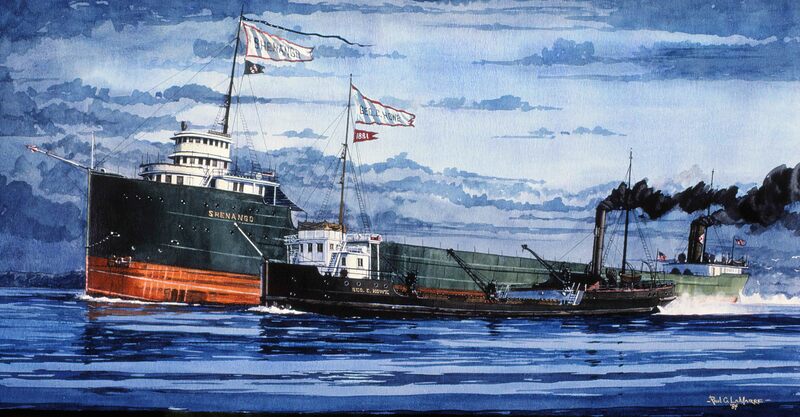 Belliveau's work is that of an artistic disciple of the late Frank R. Crevier (1910 - 1987), formerly of Algonac, Michigan, who began doing ship "line or blueprint portraits" in the 1960's. He simply took a blueprint drawing, and reproduced it on archival paper and proceeded to color the parts as they were found on the real vessel. These were given away as account premiums, from the old Detroit Federal Savings Bank, and are highly collectible today. Other portraits were commissioned by individuals and given away or sold as limited edition prints - one of the first Great Lakes artists to do so. Belliveau has perfected this method of maritime art with his computer generated ship portraits, and certainly has elevated the art form to its highest level, yet. 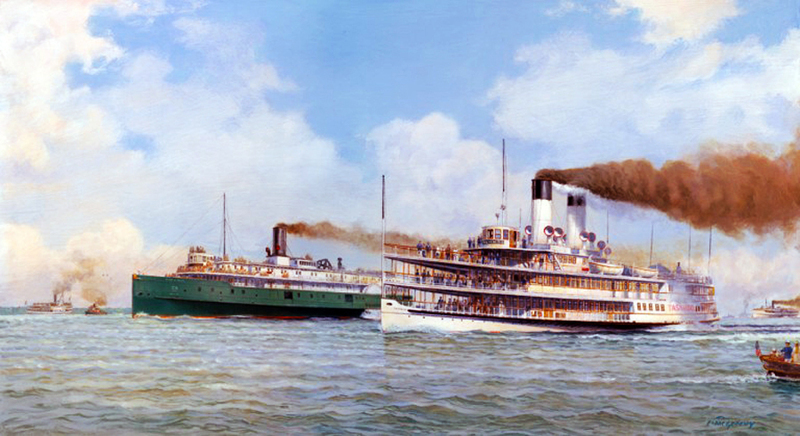 While John was drawing Great Lakes ships as a child, he began seriously exploring the new media available via the home computer in 2002, when he was in his 30's. A resident of Sterling Heights, Michigan, Belliveau has become an expert "delineator" of the current and immediate past examples of the bulk freighters and former passenger ships that traveled the Lakes. While employed fulltime in a non-maritime field, John works feverishly at his hobby of bringing new ships "online" to his digital shipyard gallery. Frequently working from just photographs, John can produce a drawing of any ship, at any period of its "life" and his current gallery has over 46 vessel portraits for sale. He has made a specialty of documenting the current Lakes' fleet, with all of it's ownership and vessel changes. He is also considered an expert on the current ships found in both the American and Canadian fleets. With a whole fishing village named after his ancestors, Belliveau Cove in Nova Scotia, John Belliveau has recently added new artworks showing the typical vernacular saltwater Coastal schooners of that area. These were similiar in design to the more well known "Grank Banks" style ships, and as he has started documenting his family history, he has also begun illustrating the fleet of trading schooners they once owned. Let John help you preserve your favorite ship for posterity by commissioning an original ship portrait from him. If you are interested in ordering a picture from him, drop him an email and say that "Keith sent me" - and he will be sure to get back with you! Erie Maritime Museum - Museum and Sailing Ship "NIAGARA"
All Content Copyright © 2007 - 2016 Keith M. Steffke. All Rights Reserved.